What's the Deal with Mississippi Pot Roast? If you've ever done a google search for "best pressure cooker recipes", chances are that you've run across a recipe for Mississippi Pot Roast. Why is everyone so obsessed with this pepperoncini-laden pot roast? I'm about to give you the low-down. When I first read the ingredients list for Mississippi Pot Roast, I thought - seriously? Beef chuck, a packet of ranch dressing mix, a packet of au jus mix, butter, and pepperoncini peppers - that's what makes up of one of the internet's most beloved slow/pressure cooker recipes?! Admittedly, I am a bit of a snob about processed ingredients and tend to avoid anything containing the word "packet" or "mix", but I can also recognize a killer recipe when I see it - and the proof is in the pudding (or, shredded beef) - with this recipe. Look no further than the fan pages of any pressure cooker Facebook community, or simply google "best pressure cooker recipes" to find endless praise of the Mississippi Pot Roast. Bloggers like Belle of The Kitchen have helped make this recipe infamous across the internet. The dish seems to have gained it's glory as a slow cooker recipe, though as blogger The Country Cook points out, no one can really seem to pinpoint the recipe's exact origin. The Country Cook loves Mississippi Pot Roast so much, and it has performed so well on her blog, that she's now created recipes for Mississippi Chicken and Mississippi Pork Roast. Her recipe, like many others, actually calls for a packet of "dry onion soup mix" versus the packet of "au jus mix" that many others called for. I knew I wanted to create a version of Mississippi Pot Roast that was free of processed ingredients and chemicals, so understanding what flavors the "dry onion soup mix" and "au jus mix" provided in this dish was the most important thing I had to solve. The other "packet" - ranch dressing mix - was easy to solve for - I've made homemade ranch dressing countless times, and knew exactly what flavors it was adding to the dish and how to solve for them without the packet. So off I set, on a quest to better understand the merits of "dry onion soup mix" and "au jus mix". A simple google search turned up the ingredients quickly enough. Woah, you guys. I have a stomach ache just READING those ingredients. I mean, are you kidding me? The only ingredients on that list that are easily purchasable at a grocery store are salt and onion powder. That is NO BUENO. I like to live by the expression "if you don't recognize an ingredient, your body won't either" and I don't recognize 12 out of the 14 ingredients listed in a packet of "au jus mix". 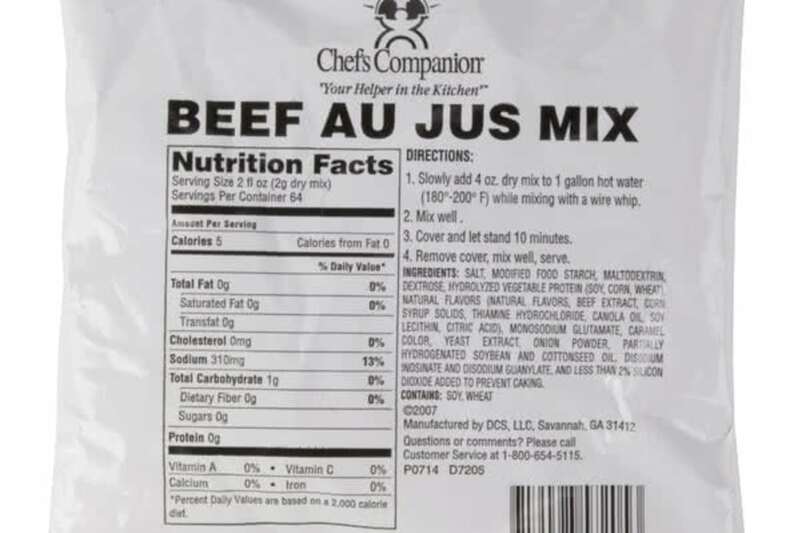 In fact, if I didn't what "au jus" was, I would have absolutely no clue what flavor this packet was trying to create. Luckily, I know that au jus is the gravy or broth made from the juices given off by meat as it is cooked. I also know that when this recipe was created, it was created for a slow cooker, which does not require liquid to cook. The ingredients for "dry soup mix" are just as spooky. Ok, so not quite as bad as the au jus packet! 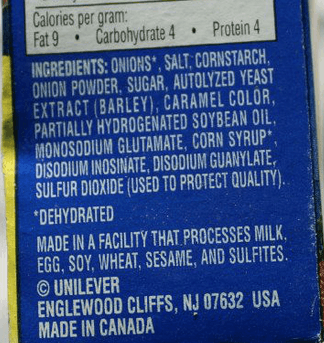 It's a great sign that onions, a clearly recognizable ingredient, are the first ingredient listed - that means they have the highest volume in the packet. "Au jus mix" is a terrifying product and should be avoided at all costs. Basically, a bunch of chemicals are mixed together to mimic the flavor of beef broth... so I'm just going to use a good, organic beef broth instead! I'll also add a generous pinch of onion powder to mimic the onion powder found in "au jus mix" as well as in "dry onion soup mix". The "dry ranch dressing mix" is similarly spooky - but luckily I'm well versed in how to make a fresh ranch dressing. Onion powder, garlic powder, dried thyme, and dried parsley will help mimic those flavors, without all the unrecognizable ingredients. With this research in mind, I set off on a quest to make the perfect Mississippi Pot Roast, with none of the *B.S. * ingredients. First, I made it the chemical way - and then I tweaked my non-chemical recipe until I got it spot on, nearly identical to the original version. My clean Mississippi Pot Roast is available here, and you can view the video below! Happy pot roast-ing!